Experience the ancient art of archery with the help of modern day equipment. Competent instructors will help you master the technique of shooting a re-curve bow. 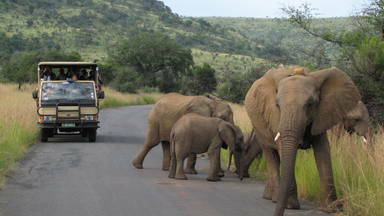 Guests are collected from the Sun City Welcome Centre and transferred through to Letsatsing Game Reserve; the transfer takes approximately 10 minutes. On arrival guests are met by the guide who will take them through the safety procedures. After the safety briefing, the activity commences for approximately an hour. After the activity, guests are transferred back to Sun City Resort. Guests or SpectatorsAll guests to be at the departure point, Gametrackers desk situated in the Sun City Welcome Centre, 15 minutes prior to the scheduled departure time as indemnity forms need to be signed. Unaccompanied minor (person under 18 years of age) - Parent/Legal guardian must sign the indemnity forms on the minors' behalf before departure. There is a Kiosk at the “Outdoor Adventure Centre”. Only Rand (ZAR) accepted. Credit/Debit Card facility is also available.